The Colorado Marathon is coming back in May and is ready to maintain its reputation as one of the best Colorado marathons! The 2019 Colorado Marathon will take place on May 5, 2019, in Fort Collins, Colorado, for its 18th year. We’re excited to bring our race to runners from all over the world once again, thanks to the support of Kaiser Permanente and many other sponsors. The Colorado Marathon is an ideal race because the course is almost entirely downhill. The marathon begins in the Cache la Poudre Canyon at about 6,000 ft. and ends in Fort Collins at about 5,000 ft. This makes for an extremely fast course, which has given many runners the advantage of finishing faster than they would in other races at lower elevations. This is the reason that most 50-state marathon runners choose our race over others in order to check Colorado off their list! The Cache la Poudre River Canyon is quite a phenomenal spot. As Colorado’s only nationally designated “Wild and Scenic River,” the Poudre River does not disappoint. Views can’t be beat, with the winding river, rock formations, and gorgeous, jagged mountains surrounding the road and the river. A place to get away from it all, the Poudre Canyon holds a special place in our hearts. Our marathon and half marathon are unlike any other because they begin in this rugged canyon, and we know you’ll love what you see. Speaking of location, the finish line of the 2019 Colorado Marathon is located in beautiful Fort Collins, Colorado – a gem of a city to finish in! With the iconic scenery of Horsetooth Rock and the foothills and a lovely Old Town area (Disneyland’s Main Street USA was created to look like Old Town, Fort Collins), this small city has its fair share of exciting things going on all year round. With dozens of craft breweries (here’s our favorite!) and loads of restaurants, you certainly won’t go hungry or thirsty when visiting Fort Collins. Fort Collins also boasts several paved biking trails, hiking trails, Horsetooth Reservoir, a drive-in movie theater, and so much more. The 2019 Colorado Marathon is in its 18th year, and we couldn’t be more proud to bring runners an extremely well-rounded race. The Colorado Marathon not only hosts a full marathon race, we also host one of the best half marathons in Colorado, a marathon relay, a 10k, and a 5k. The Colorado Marathon has something for everyone, whether you’re an avid runner looking for a beautiful race, or a competitive marathon runner looking to qualify for the Boston Marathon – which brings us to our next reason! The Boston Marathon is the world’s oldest annual marathon. In order to participate, you must first qualify by completing a Boston-qualifying marathon under a certain amount of time. The Colorado Marathon is one of the best marathons to qualify for the Boston Marathon because of our downhill course. The gradual decline in elevation gives runners a fast advantage that not many other Boston qualifier races provide. In fact, each year the Colorado Marathon qualifies 16-18 percent of all participants. That’s pretty fantastic! So, if you’ve always wanted to check Boston off your marathon list, sign up for the 2019 Colorado Marathon now. For years, the Colorado Marathon has strived to be a leading organization that donates back to our incredible community. Each year, the Colorado Marathon partners with nonprofit organizations that provide volunteers for race day. Check out the list of organizations we give back to here. Gather your friends, family, and coworkers for the chance to win a donation to the (approved) charity of your choice! 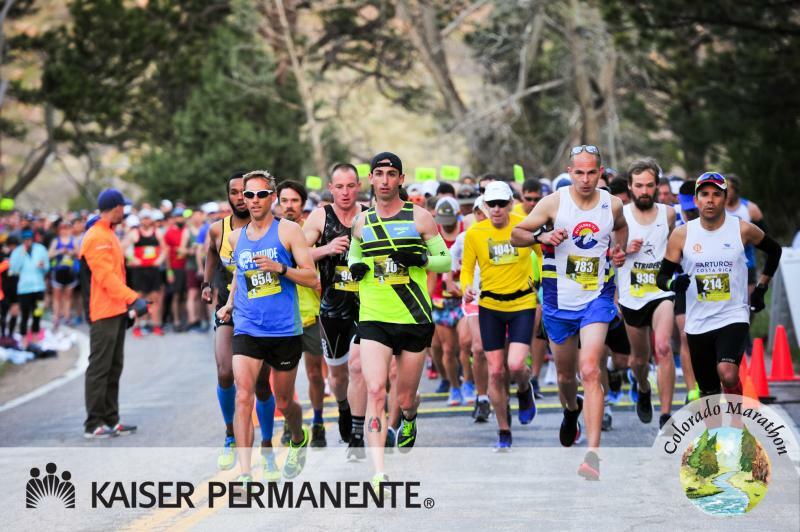 Title Sponsor Kaiser Permanente’s Team Challenge is a fun and exciting way to encourage your community to sign up for the Colorado Marathon in hopes of winning $500 to donate to the charity of your team’s choice. The great part about this challenge is that it doesn’t matter which race your team members sign up for – all participants on your team could be running different races in order to qualify. Simply let us know your team name when registering! Throughout the next few months leading up to the Colorado Marathon, we’ll bring you monthly email newsletters and blogs to help with your training and preparation for the 2019 Colorado Marathon. Subscribe to our newsletter and stay tuned to our blog for training tips, nutrition tricks, and more.